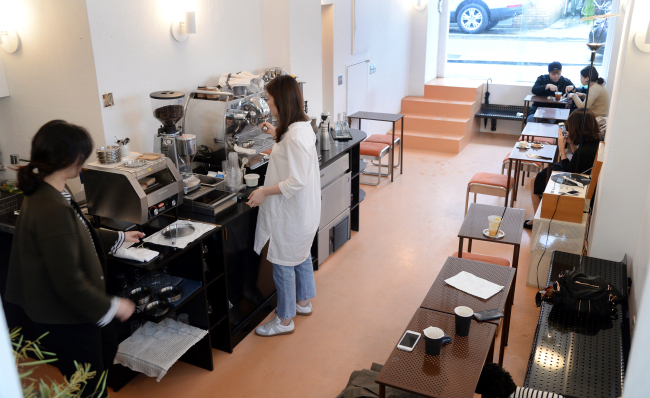 Located on a quiet stretch of a Cheongdam-dong street, Cafe Halfmoon looks like it would lead a relatively obscure and tranquil existence as a neighborhood hangout. That is not what happened when the cafe opened in January. “The first day of our soft opening we had one customer,” said co-owner Yoon Young-sim, 26. “The second day people started showing up,” said co-owner Lee Ha-jung, 26. Since then, both Lee and Yoon, friends who teamed up to open Halfmoon, have been busy. Lee and Yoon attribute blogging and Instagramming to the quick spread of the word of their new place. Bolstered by a solid menu featuring brews, sodas and toast, the cafe does not disappoint. Aside from the usual Americanos and espresso, there is the halfmoon con panna, a double espresso topped with a generous dollop of fresh cream. One sip reveals that the cream is flavored with Earl Grey tea, adding a layer of fragrance to the potent brew. “We tested out a lot of different ingredients with the cream,” said Lee. In addition to coffee, Lee and Yoon also serve ginger soda crafted from ginger ale and ginger stewed in honey for a sweet, fizzy and slightly spicy beverage. Bites include dishes like couscous salad and turkey-cranberry sandwich as well as their popular ricotta cheese toast. For the toast, Lee and Yoon source artisanal whole wheat bread that has been cut into thick slices and toast it on their conveyer toaster for bread that is crisp on both sides. 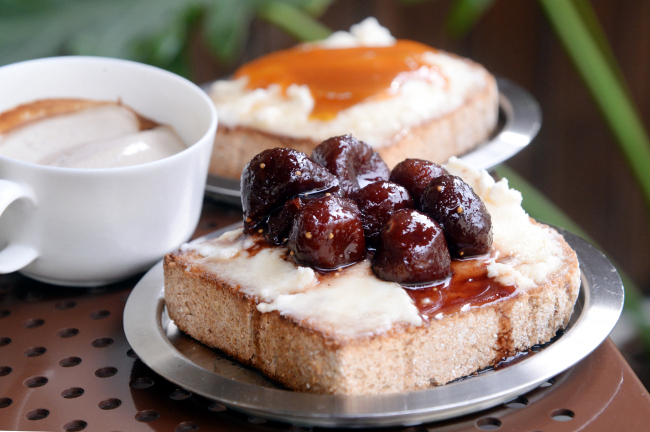 The toast is then topped with housemade ricotta cheese, maple syrup and either apricot jam or figs stewed in port wine. “Our toast is made with 100 percent whole wheat bread,” Lee said, adding that the stewed figs are made in-house along with the ricotta cheese. “We make our ricotta cheese two to three times a day,” said Yoon. Sweet, chewy figs, creamy, thick ricotta and warm, crisp bread make for a fortifying, healthy-ish snack. All these eats and drinks can be enjoyed in a warm, terracotta-hued space with high ceilings, an open kitchen and a picturesque terrace. “We wanted a communal space,” said Yoon of the seamless flow of the cafe, where the kitchen and seating are not separated by walls or counters.